Chicken in a Barrel BBQ has opened at 5711 Calle Real in Goleta, the former home of Petrini’s and Luigi’s Pizza & Pasta. 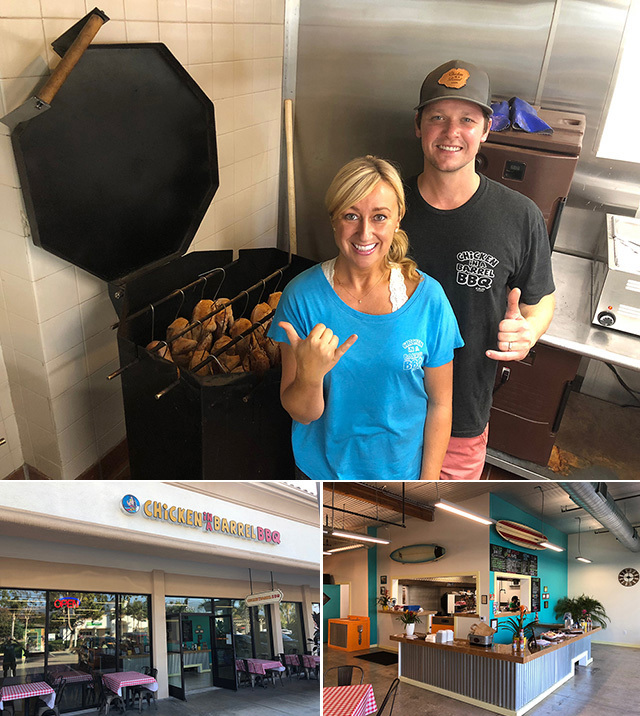 Owners Alex and Jennifer Vilera hadn’t planned on opening their own restaurant but after they moved from their home in Hawaii (home to Chicken in a Barrel BBQ) to California, they realized that the only way they were going to satisfy their craving for food from their favorite restaurant was to open their own location. There are now four Chicken in a Barrel BBQ locations on Kauai and one on the mainland in Lake Tahoe. The restaurant has been on the Food Network and has a big following. The entrée menu includes the Chicken in a Barrel Plate, Sampler Plate, Babyback Ribs Plate, Chicken & Rib Plate, Beef Plate, Pork Plate, Chicken for Two, and Hoagie with Fries. The plates include a side of brown rice with chili beans and range in price from $12.99-$17.99. Also available are a kids menu, salads, a la carte options, sides, grass-fed beef hamburgers, and Mexican food offerings. “We’re thrilled to have the Vileras as our first franchisees,” said Mike Pierce, Chicken in a Barrel founder and owner. “It was very important to us that our first franchise partners share the same goals and family values as we do, and Jennifer and Alex are a great fit in that sense. They, too, intend to spread the love of God with this business, and plan on creating a family-friendly atmosphere. We’re looking forward to seeing what great things come from them and the growth they’re bringing to the brand.” Chicken in a Barrel BBQ is open daily 11 a.m.-9 p.m. Call 805-324-4234. I will just say that barrel better put out some great tasting chicken because it doesn’t look much different than the Santa Barbara Chicken Ranch but at a premium price. It’s chicken with sides of rice and beans. No tortillas. Really looking forward to trying it soon. A huge disappointment. Do NOT order the beef. All it is is a scoop or so of pulled beef served all by itself, with nearly flavorless brown rice and beans. I also got a side of macaroni salad (a Hawaiian mainstay), that was similarly unexciting. An array of barbecue sauces is available to give the food flavor, but for people who aren’t into BBQ sauce, that doesn’t quite do it. Sauce is to enhance flavor, not disguise it. And for what you get, Chicken in a Barrel is very, very expensive. Rex, did you try the chicken? The chicken is soooooooooooo much better than chicken ranch. The chicken at Chicken Ranch is always so dry, its like eating saw dust. Chicken in a Barrel was flavorful and juicy. I do agree most of the sides were nothing to write home about, and the price is a tad high, but as for the two meats I got (chicken and ribs) it beat the snot out of anything that we have in SB currently. I completely agree that Chicken Ranch chicken is way too dry. I don’t understand how people can eat it, lol. For fast food type places, the chicken at Chipotle and the teriyaki chicken at Panda Express are tender, although we stopped going to Chipotle after all the incidents. The Panda Express teriyaki chicken is grilled and really good if you can get it fresh and made well (not burned on the grill). We get it without the sauce, and it’s already flavorful. I’m picky about chicken, won’t eat anything dry, and am always on the lookout for chicken that’s juicy, tender, and not salty. I’m looking forward to trying Chicken in a Barrel. Well, either Chicken in a Barrel is really inconsistent, or others have very different standards of what juicy and tender mean. We went tonight and tried the chicken and ribs. The chicken wasn’t super dry, but it wasn’t juicy and tender. It was just average, more on the drier side. The ribs were okay, definitely not fall-off-the-bone. Some parts of the ribs were drier than others. Based on this experience, we won’t be returning. Surprised to hear that about the chicken. In my experience, I will always give a place 2 tries, especially one that just opened. There was no debate about the chicken I had being moist and juicy. I agree the ribs are not fall off the bone, but that’s the way I like them, just shy of that. I find that if ribs are cooked to “fall off the bone” status they lose too much flavor. I love good chicken! Heading there tomorrow! Nope. It is just as dry and boring as the pictures suggest. What a disappointment. Like Josh said, I might have given this place two tries but it’s honestly not worth my time or (considerable for what you get) money. Why can’t we have nice things?? !